The 17th International Meeting for Leaders of Peace Centres and Medjugorje Prayer and Charity groups will be held in Medjugorje from the 28th of February to the 4th of March 2010. Father Ivan Landeka, born in Rastovaca, in 1954. Attended Posušje elementary school and classical grammar school in Visoko. He joined the Franciscan Order of the Franciscan Province of Herzegovina in Humac in 1973. He began his study of philosophy-theology in Sarajevo and concluded it in Augsburg, in which he was ordained minister in 1981. He served as parish chaplain in the Parish of Humac from 1988 to 2000 and as pastor in Medjugorje between 1991 and 2000. He was the pastor of the Parish of Humac between 2000 and 2005 and is currently working as pastor in the Parish ofKocerin. Father Ivan Ivanda, Ph.D. born in Tomislavgrad on March 17, 1964. Attended elementary school in Bjelovar and classical grammar school in Visoko. He joined the Franciscan Order of the Franciscan Province of Herzegovina in Humac in 1983. He began his study of philosophy-theology in Sarajevo and concluded it in Fulda (Germany), in which he was ordained minister in 1991. He served as chaplain inTomislavgrad between 1991 and 1993 and Bukovica between 1993 and 1995. He then leaves for Rome, in which he successfully defended his doctoral dissertation from fundamental theology, on the topic of "The Problem of Evil in the Theology of Hans Urs von Balthasar" in 2001. He thought theology at the Department of Catechism of the Catholic Theological Faculty in Zagreb between 2001 and 2005, served as parish chaplain in the Široki Brijeg monastery between 2005 and 2007 and has been performing the same service in the Parish of Cerna since 2007. He cooperates with the catholic magazine "Naša ognjišta" (Our hearths) on a regular basis. He published several articles in professional magazines, translates and writes. Father Danko Perutina, born in Sarajevo in 1970. Having completed elementary and high school, he joins the Franciscan Order of the Franciscan Province of Herzegovina in 1991. He studies theology in Zagreb. He was ordained minister in Norval, Canada in 1999. He serves as parish chaplain and assistant seminarian instructor in Humac between 1999 and 2001 and parish chaplain in Medjugorje between 2001 and 2002. He studies Mariology in Rome and earns his master's degree at the Pontifical Marianum Theological Faculty, on the topic of: "Virgin Mary in Intellectual and Spiritual Education". He has been deputy instructor of novices and postulants since June 2005 and has been serving as parish chaplain in Medjugorje since 2007. The 17th International Meeting for Leaders of Peace Centres and Medjugorje Prayer and Charity groups will be held in the New Hall in Medjugorje from the 28th of February to the 4th of March 2010. The number of places is limited due to space, while every year the number of participants increases. This is why we kindly ask you to register your arrival at the seminar as soon as possible. You can send your registrations by fax: 00387 36 651 999 (to the attention of Marija Dugandži?) or by email: seminar.marija@medjugorje.hr. Simultaneous interpretation will be available for all language groups. The price of the seminar is 60 € per person. This includes all fees for the organisation and running of the seminar (lecturers, simultaneous interpretation and joint lunch on the last day). Upon payment at the beginning of the seminar each participants will receive his/her accreditation, which will enable him/her to take part in the seminar activities. 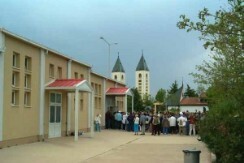 Each person should personally organize his/her own accommodation in Medjugorje. We look forward to receiving your registrations and to welcoming you at this meeting!